When we visited a moutarderie in Dijon in 1996, I was amazed to discover that the mustard seeds used were grown in Canada! We decided not to buy mustard to take home as a souvenir…. On one of our bicycle holidays in France in the last century, we blundered into the town of Charroux, only to discover truly spectacular mustard there. If you get happen to be in the Vichy area, the Charroux Moutarderie is well worth the visit. Make sure to sample some of the mustards and in spite of the high prices, buy at least one jar. You won’t be sorry! But. 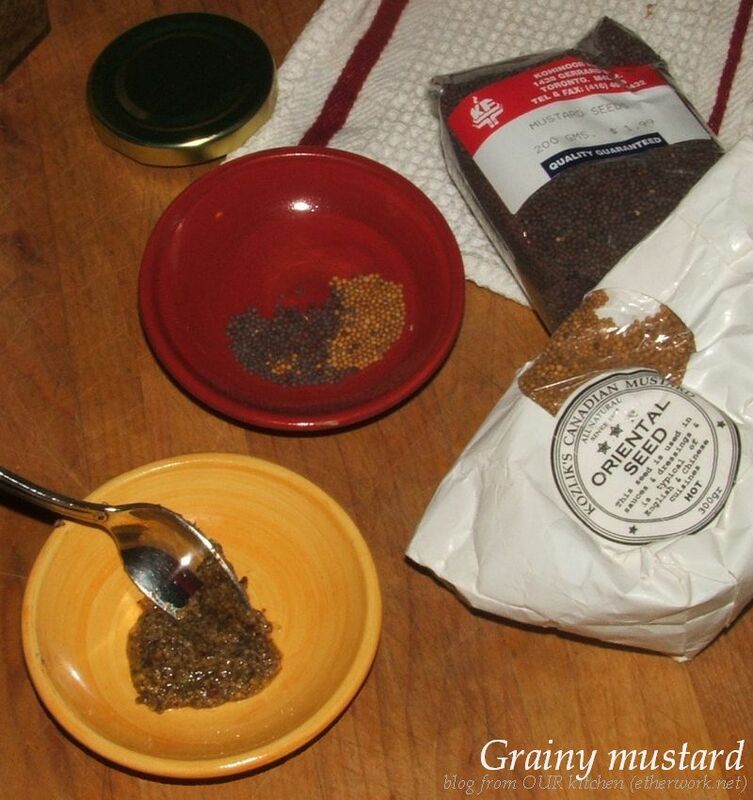 Almost equally brilliant is home-made mustard. Not long before that wonderful bicycle holiday in France in 1998, we went to the Royal Agricultural Winter Fair in Toronto and tasted the best mustard we’d had in a long time. The woman at the stand had made it and was handing out recipes. We learned from her that prepared mustard has a shelf life and tastes much better if it is freshly made. She was right!! Do make some mustard today. Like us, you too will never buy Grey Poupon or Maille mustard again. We get brown mustard seeds in India Town (Kohinoor Foods on Gerrard) and Asian yellow mustard seeds at Kozlik’s Mustard in St. Lawrence Market. Both the brown and Asian yellow mustard seeds are hotter (and more flavourful) than the bright yellow seeds that are used for making Ballpark mustard. VICHY Sunday 18 October 1998 8:05 am 10C cool and quiet! The church clock just chimed 8:00. There is a crow calling and various other birds singing and otherwise it is silent. Did I say Vichy is flat?!? We just rode out of Vichy and around on rolling hills. The climbs weren’t quite as steep as in the Languedoc but more than expected! We then went to […] look at the ancient mustard factory where we bought some excellent mustard for 11 FF. I’m quite surprised that I didn’t write more about our experience at the Charroux mustardery. We spent at least an hour there, wandering through to gaze at the ancient machinery and grindstone, then standing in our slightly shabby bicycling gear next to elegantly and expensively dressed tourists (I recall seeing one slightly sneering man wearing very very beautiful fine leather shoes clearly made by an exclusive designer) in the little shop, to sample a variety of truly spectacular mustards. We would have bought a jar of each one if we hadn’t been travelling on bicycles with pretty much zero space for any extra luggage. After a lot of deliberation, we chose to buy a jar of the “traditional” flavour, even though several of the others were equally fabulous. The “moutarde de Charroux” is unique, and was created 900 years ago by monks from the Bourbonnais in the Auvergne region […] considered by the gastronomical press as the best in the world. It is processed traditionally by a single family, following the ancestral recipe of French “Moutarde”. A century old grindstone crushes the entire mustard seed (shell included), which gives the incredible texture of the Charroux mustard. The confidential “verjus” made of wine, vinegar, spices and salt is later added. At the very end, the white wine of St. Pourçain (Tressalier grape), which has the prestigious AOC label, is added. Yes, indeed, that mustard really was brilliant! We kept our little jar; we couldn’t bear to throw it away. Now it holds face cream…. I love that we can still read the best-before date (21 September 1999) and the ingredients list on the back of the jar! Hmmmm, maybe we should add vintage wine to the list of ingredients in our grainy mustard recipe. This entry was posted in food & drink on Wednesday, 30 July 2014 by ejm. Perfect timing! I’ve been meaning to find out how you make your own mustard. The available grainy mustards in the store have so many icky ingredients added that I haven’t even bothered to try them. I can’t wait to try it added to steamed vegetables.